Bio break on Sunset Boulevard, originally uploaded by Erin *~*~*. Ok I am happy now – I’ve had some lunch and washed up. Now I can scout Muppet merchandise for Niece No. 5 (age 6). Tinker Bell’s friend Lizzy, originally uploaded by Erin *~*~*. I think I am turning into my grandmother, God rest her soul. Nanny was quite devoted, in her later years, to a Cabbage Patch doll, which she officially adopted with paperwork and everything. I am probably similarly destined to become a doll-devotional. 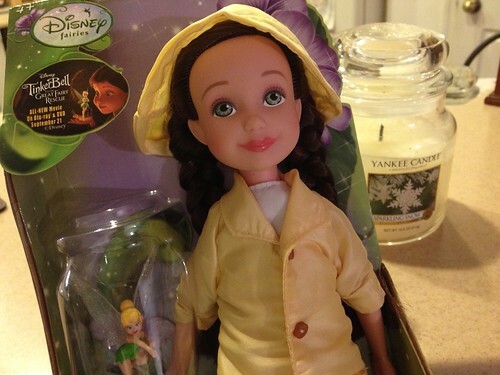 I have never even seen the Disney film in which my beloved Tinker Bell and this "Lizzy" become BFFs, yet I rescued this doll from a lonely fate. For months and months, she has been languishing on the same shelf in Target, the last of her kind, unpurchased, unloved, unwavering in her green-eyed, wistfully hopeful gaze. Each time I headed down that aisle (and WHY was I headed down a toy aisle, hmm? ), I thought for sure she would be gone, happily transported home in the arms of some thrilled little person who would love her to pieces. Each time, although surprised and unhappy to see her in the same spot, I told myself that if she was still there next time, I’d take action. It’s not right, I tell ya. I have had enough of "next time". NOW is "next time". I had to rescue her. Wrong. Just. So. Wrong., originally uploaded by Erin aka Tink*~*~*. 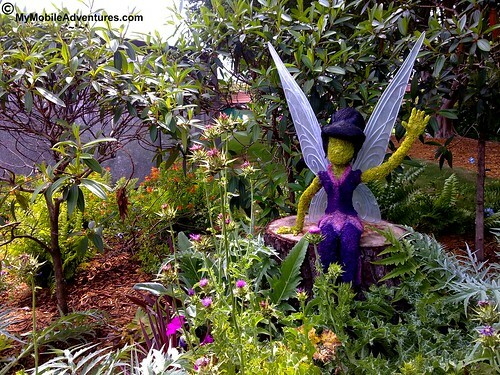 🙂 Even if you’ve only been reading My Mobile Adventures *~*~* for a short time, you know that I’m not a fan of the “Disney fairies”, Tinker Bell’s alleged little friends from her alleged home of Pixie Hollow [see 5 Ways Disney has defiled Tinkerbell]. Still, I like to think that my prejudices still leave room for giving credit where credit is due. 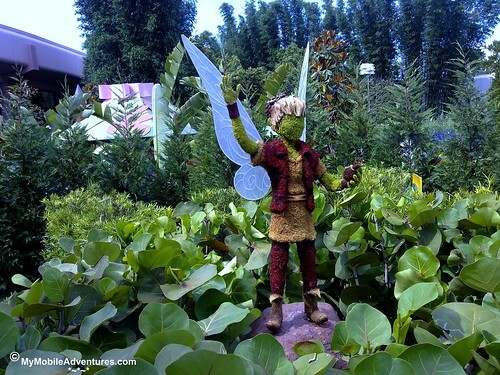 The Pixie Hollow display outside the butterfly house at EPCOT this past spring was a study in how to make great topiaries. Even without facial expressions, the artists who create these masterpieces manage to convey personality and emotion in every piece they created in this garden. I’m going to shut up now and just let you look. 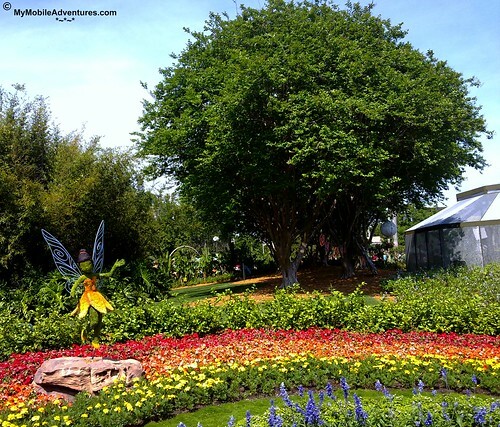 Brava, bravo, bravi Disney horticulture team! You might think this is odd, but when it comes to leaving a Disney park, I plan my exit route around how many shops I can hit as I make my way toward the gate. (Long-time readers are feigning shock. Tink *~*~* – a shopper? No! Really? ;p ) There are a couple of reasons you should consider doing this, too. 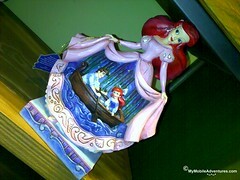 One, you are addicted to Disney merchandise, and even if you’re not buying, you’re still looking. Two, if it is a really hot day, the shops are your air conditioned refuge. Some of them are quite long, actually a series of shops strung together; you can get from one to the next without having to exit to the sidewalk. For instance, at the Magic Kingdom you can enter Casey’s at the rear where the bleachers and cartoons are, and walk clear down to the Emporium without ever having to leave the comfort of climate control. At Disney’s Animal Kingdom, there are major shops spaced out all around Discovery Island, so no matter which land you are coming from, you’re passing merchandise and cool air. The shopportunities are just too good to pass up, so you enter to see what you can see. Much of the merchandise will be similar to what you just saw in the last shop you were in, but once in a while you come across something unique, different…. ok, odd. 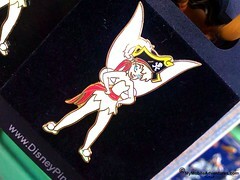 Take this Pirate Tinkerbell pin as an example. Adorable, right? Well, yes – but only until you get close enough to realize that her eyes are these strange, glowing, neon blue blobs and it makes her look like a pod person ready to shed her humanoid form and take over the planet. I would have bought her, except that she gave me the willies! 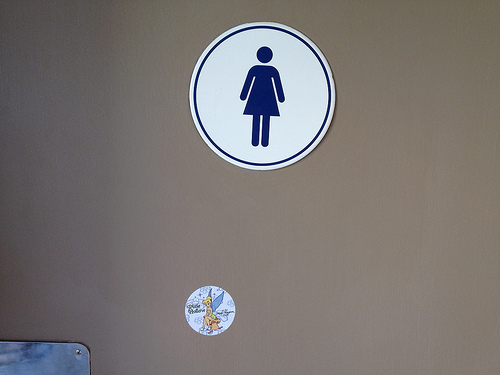 Here’s another head-scratcher. We already knew that Ariel didn’t have legs until her dear Auntie Ursula gave her some in exchange for her lovely singing voice. What we didn’t know is that Ursula apparently reneged on the deal, for here we see that instead of legs, Ariel’s got a miniature theater under her skirt, complete with her own “mini-me” shown here in the boat with Prince Eric. The statue is very pretty but when you think about it, she’s actually floating legless above a rowboat and that’s just a tad bizarre. I passed on this one, too. 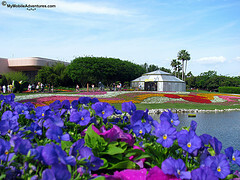 Do you cut through the shops in the Disney parks to cool off? 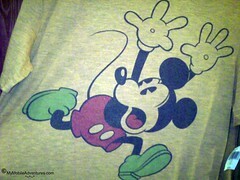 And what’s the strangest Disney merchandise you’ve ever seen? 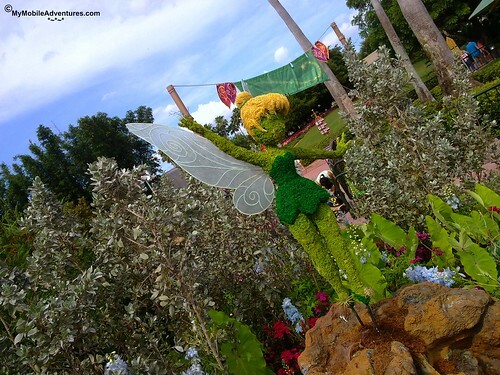 😡 This is probably the last photograph I will be able to take of a Tinker Bell topiary at the International Flower and Garden Festival, which takes place each spring in Walt Disney World’s EPCOT theme park. 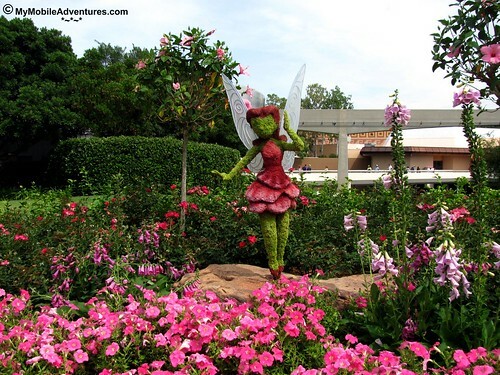 The reason for this is that the Walt Disney Company, in its infinite wisdom, has decided to mess with the Tinker Bell character in order to cash in on her popularity, and I don’t think I’m going to be able to be brave enough to visit the Tinker Bell section of the festival ever again. Disney’s gone an made a movie filled with grave inaccuracies and a computer-generated effigy of the true Tinker Bell, and I could not be more upset! 😡 grrr! Did you know they’ve actually got her TALKING in the film? 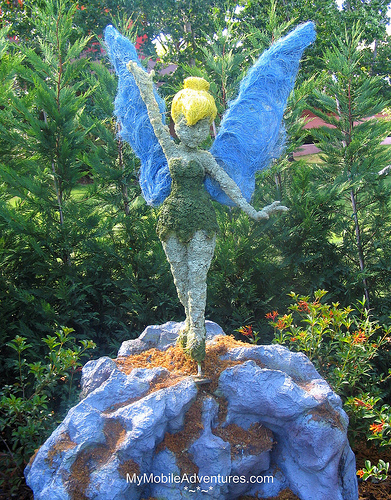 Tinker Bell should NOT speak – ever. 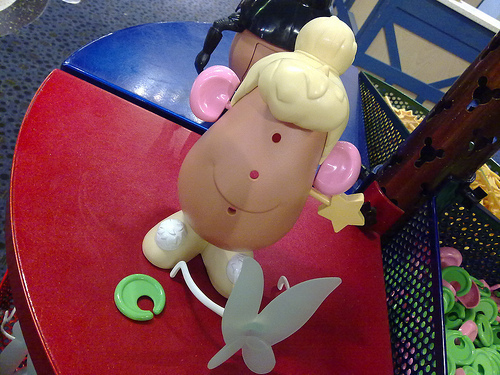 And nowadays, they’ve got her running around the parks – as a FACE character! You know, an actual PERSON. Hey, isn’t she supposed to be able to fit in the palm of your hand? My childhood dreams are shattered. I’m traumatized, I tell ya! 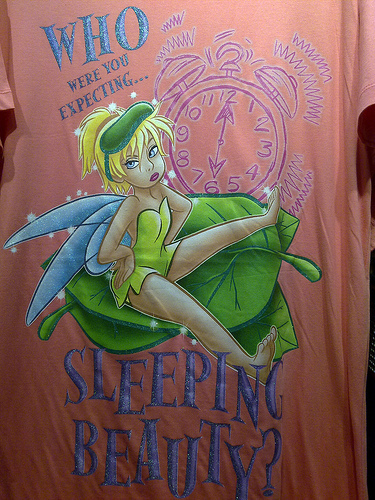 This is no way to treat Tinker Bell. Her entire mystique is being destroyed. Oh, and this has been yet another victory in the Monday Meme Trifecta. The prompt for Manic Monday today is “plant”, and I’ve got Tinker Bell’s yellow hair and blue wings to cover Mellow Yellow Monday and Blue Monday.